Apple is suffering from a major leak that has allowed 9to5Mac to discover images of the upcoming "iPhone XS" models and the Apple Watch Series 4, giving us an idea of what to expect when the new devices are announced on September 12. As can be seen in the photo below, the new Apple Watch models feature smaller bezels for more visible screen space, which allows for new complications arranged in a round configuration, which could be a nod to the media invites that went out earlier today. Rumors have suggested the displays of the new Apple Watch models are 15 percent larger, which appears to be in line with the video. Apple is clearly planning to introduce at least one new watch face, which appears to be able to support a total of eight complications. Four complications are included on the watch face itself, underneath the hands, while another four are located at the edges of the display. 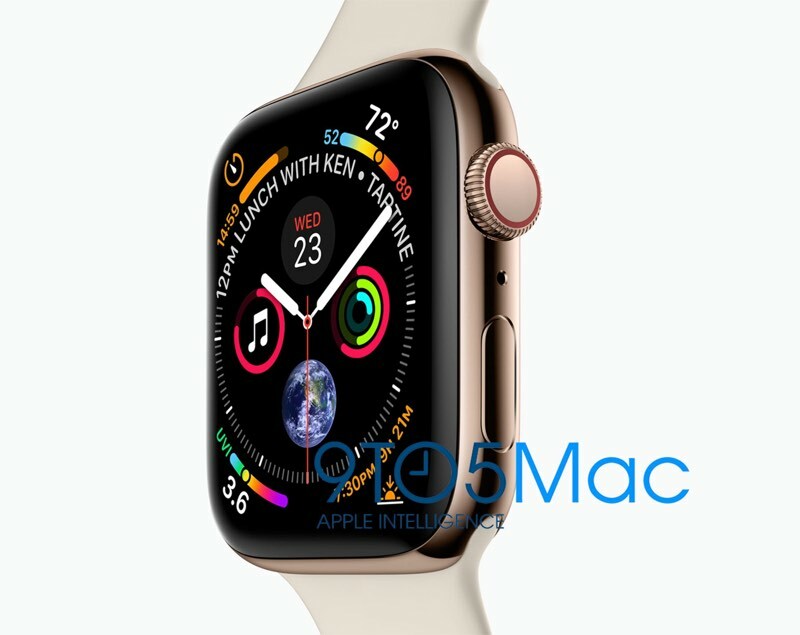 Interestingly, the Apple Watch in the image features a shiny gold enclosure, which appears to be shinier than previous aluminum models, perhaps suggesting a stainless steel option with a gold finish. It could also be shiner in the Apple marketing materials, though. There's a new hole below the Digital Crown, which is perhaps another microphone, and the Digital Crown has a red outline rather than a full red dot. Apple will unveil the Apple Watch Series 4 models alongside new 2018 iPhones on September 12, at a 10:00 a.m. Pacific Time event that's set to be held at the Steve Jobs Theater on the Apple Park campus. Apple will live stream the event, but for those who cannot watch, MacRumors will be featuring live coverage both on the site and on our MacRumorsLive Twitter account.